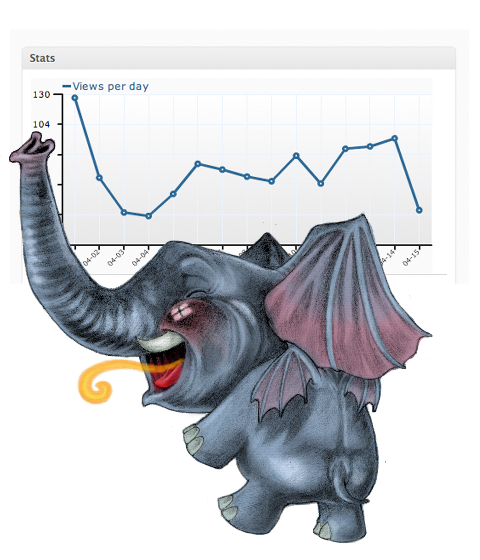 Adoring this elephantine addition to the Stat Dragon family. By the terrifically dope Aaron Zonka, who I met at a party where he was literally That Guy In The Corner Quietly Sketching Things Of Genius. If you’re in the Bay Area, check out his series of fabulous art/music shows, “Under the Table Gallery.” Live performers, exhibitions for sale and viewing, snacks and libations, the whole deal. Next one is April 24th, 5-10pm, 248 Felton Street. Thanks, Aaron! See you Monday, everybody. will be something for me to see (by him) when I am in the City in May.